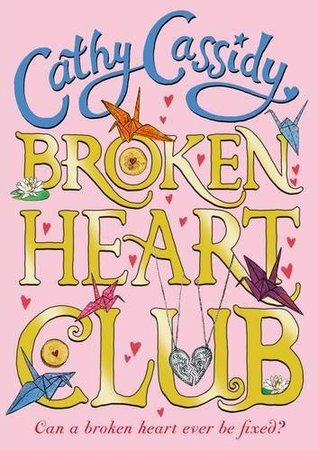 Disclaimer: I received a copy of this book from Cathy Cassidy and Penguin Random House in exchange for an honest review. Synopsis: Andie, Eden, Ryan, Tasha and Hasmita love being part of the Heart Club. They’ve promised to stay best friends forever and nothing can tear them apart. But sometimes things happen that you couldn’t ever have expected and forever might not be as long as you think. I admit, I was worried with this one. It’s been a while since I’ve read any new stuff of Cathy’s and now I’m a little older I was concerned the magic would kind of…go away. But of course, there was no reason for me to doubt Cathy’s writing or skill. No matter how old I am, it will be the amazing constant that only she can achieve. The plot…it was so intriguing! I expected this book to be a light, easy read but far from it! It follow a compelling and emotional story, and that’s just the plot. The characters…I would have loved to have seen more of them! Although Eden and Ryan were perfect main characters, I think it would have been great to have little sections from Andie, Tasha & Hasmita, too! Maybe in a diary form or bonus letters or text conversations between the characters at the end of the book? The writing…Cathy could never fail! She made a simple break between friends into a complicated, deep, meaningful story. It was beautiful and poetic, making me laugh and cry. I couldn’t have hoped for anything more. Something I liked…as I mentioned above, this book was beautiful. Yet it was so easy to read and follow, I couldn’t stop! I love the mix of amazing quotes and raw, honest emotion. It worked perfectly, and both things completely bounced off one another. Something I disliked…nothing! This book gave me everything I could have hoped for and more. Thoughts…what a perfect book. It reminded me very much of Beautiful Broken Things by Sara Barnard, both books a poetic and raw way to describe the complicated beauty of broken friendships. If you love unique books that don’t focus wholly on young love, you need to try this novel. It’s raw and it hurts…but it’s also full of love. It’ll make you cry and make you laugh…but emotion is what makes this book what it is. And that, that is exactly what a novel should be. Mid-week update! Hi everyone! So my exam went pretty good yesterday. It could have gone better but it could have also gone a lot, lot worse. At least now I think I’m in with a chance at getting a C, even though I’m not confident about it. My next paper is on Friday, but after then I’ll be back on this blog every day! I have been missing this blog a lot but it’s definitely right for me to have a break. And my reading state? Well, I’m still getting through Red Queen, but I’m hoping the one day break I took to read Broken Heart Club will give me the motivation to get another 100 pages (at least) in before Friday. We’ll see, but I’m hoping to be writing a review about it on Sunday at the latest. Hope you all have a great rest of the week, see you Friday!